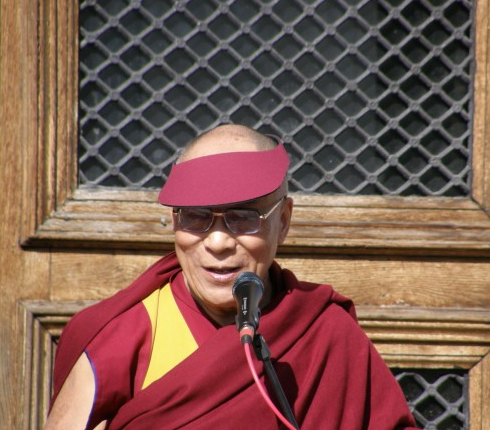 The May 10 visit to the University of Oregon of His Holiness the 14th Dalai Lama, Tenzin Gyatso, will be part of a three-day visit by the Tibetan spiritual leader to Oregon. He will be involved in several events at an environmental summit sponsored by Portland's Maitripa College, the Northwest's first Buddhist college. Maitripa College is hosting the environmental summit from May 9 through May 11. The summit – described as three days of enlightened teachings and conversations with the Dalai Lama and others – will begin with an interfaith roundtable and a public talk on May 9, at the University of Portland. The Dalai Lama will be joined at the roundtable by Rabbi Michael Z. Cahana of Portland's Congregation Beth Israel and Shiek Muhammed Najieb of the Muslim Community Center of Portland, and other regional religious leaders. They will discuss the relationship between spirituality and environmental awareness, the role of interfaith collaboration in healing the planet and other issues. The afternoon session on May 9 will be a public talk by the Dalai Lama on "Universal Responsibility & the Inner Environment: the Nature of Mind." He will discuss how the “inner environment” of the individual relates to the external environment, and afterward will answer questions from the audience. On Friday morning, May 10, the Dalai Lama will participate with scholars and scientists in "Life after Life: a Symposium," at Maitripa College. The panelists will discuss how science can go beyond providing evidence of an environmental crisis by illuminating the interdependence of individual lives and the planet – in the current life and, from a Buddhist perspective, in lives to come. The Dalai Lama will be presented an honorary degree from Maitripa College during the Friday morning session. He will then be taken to Eugene for his 2 p.m. lecture at the University of Oregon's Matthew Knight Arena, "The Path to Peace and Happiness in the Global Society." The environmental summit will continue in Portland on Saturday, May 11, with a morning session on "Universal Responsibility & the Global Environment." David Suzuki of the Suzuki Foundation and other Portland-area environmental and political leaders will join the Dalai Lama for a discussion of the roles for science, media and policy makers in prompting environmental action. The Dalai Lama will wrap up his Oregon visit with a Saturday afternoon public talk, "Inspiration for the Global Environment." He will offer inspirational reflections on how individuals can make a difference in caring for the environment. Tickets for environmental summit in Portland will go on Sale Feb. 25. Maitripa College, founded in 2005, is located at 1119 SE Market St., in Portland.